Crossworlds: The Flying City is one of the lately released titles in the hidden object/adventure genre. The game is new, but it doesn't bring lots of newness to the genre. You are to join the main characters in their journey through different dimentions and the worlds in them. 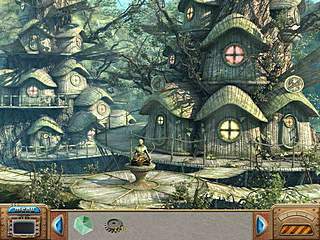 The game has many hidden object levels, but it's not the majority of the tasks for you there. You become a witness of the two people inventing a maching that can travel through different dimentions. Those two are Monica and her father. They both are professors. But how can you ever know if a thing like that really works unless you actually try it. And that is exactly what the father did. Monica joined him when she found out what he did. And you are now going to see all of the worlds wich they visit and meet all those that live in those worlds. The game has many hidden object levels, but it's not the majority of the tasks for you there. You will have to do a lot of walking around trying to get further in the game. 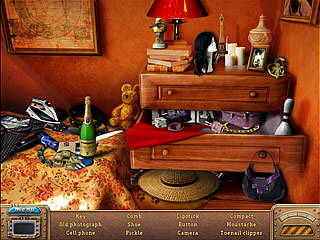 The hidden object scenes are not over clattered with every item possible. And usually you can find most of the items on the list yourself. But there is a hint system for the cases when you are stuck with something. The interactive part of the game is clear about what to do most of the time. Sometimes you don't understand what to do with or how to use what you see just because you didn't go somewhere else where you need that something. 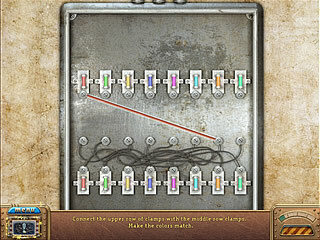 There are also different mini-games in the game where you have to solve different little puzzles. All of those are familiar, but they are good for a change in the game. Those mini-games are skipable after a while. That function can be very useful with the ones like the very first one, where you had to connect the colored items according to the colors, but how in the world you can see where those cables go I don't know. As to the gaphics of the game, they are not extremely gorgeous. I would say that they are rather simple, but they do their job. They look better when you get to those fantastic worlds, but it is personal of course, and may not be an issue for some. I would recommend to get the trial version of Crossworlds: The Flying City first if you are considering buying it. This is Crossworlds: The Flying City review. Download this game here.